Twitter is continuing to grow in market share (currently 5.3 % in the United States, Feb 2013), which has caused twitter to evaluate and implement new features. We have entered the phase of Twitter’s life where these updates are revisional in nature; with a focus on trying to create the perfect place for someone to spend time without leaving the site (something all social networks are doing). Twitter is currently a great way of communicating publicly with a large amount of individuals. This is great for sharing content, but when you want to interact with just one person, how can you on Twitter? 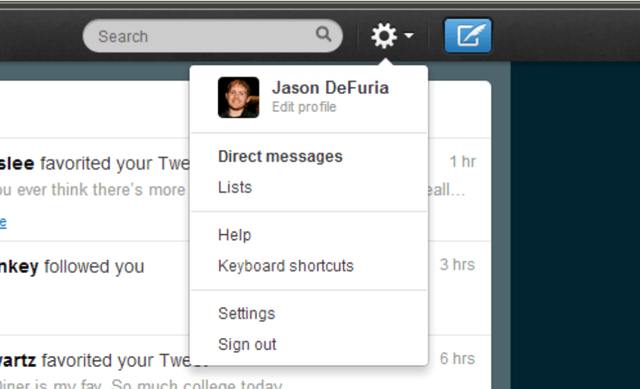 Twitter’s Solution: The Direct Message. The problem with the direct message? It’s hidden. You have to go to the gear, and there’s no alert system in place to let you easily know there are unread messages. Sure, an indicator comes up in this sub menu, but it doesn’t alert you in the cog or anywhere in the menu. My solution for direct messages? Highlight them in a different color directly in the timeline, but only you are able to see the direct message. This would ensure timely delivery of messages, as well as the privacy of only the recipient seeing them.